The world’s most famous cryptocurrency, Bitcoin, is widely known as a money-making machine as an investment in it multiplies in a few months or at times, within weeks. Last year, Bitcoin soared by as much as 190 times, making its owners millionaires. The market cap for Bitcoin ($199Bn) today is more than the cumulative wealth of the top two richest people in the world. India has over one million Bitcoin users; the country accounts for almost 10% trading in volume terms, as per media reports. According to a recent report by PHDCCI, combined trading volumes in India could be in the range of Rs200-250cr per month. In India, there are 11 cryptocurrency trading exchanges identified by the government. On 3rd March 2017, Bitcoin touched new heights as its price surpassed the market value of an ounce of gold for the first time, hitting an all-time high of $1,268. It later went on to surge till $19,891, before it went below $10,000. Bitcoin is used in worldwide payment system and is also the first decentralized digital currency. However, like any other asset or investment instrument, Bitcoin has also gone through different phases of appreciation and depreciation. Bitcoin gained over 1,900% in 2017 from under $900 to almost $20,000 in Dec 2017. Billionaire and well known investor Warren Buffett has warned that cryptocurrencies would have a bad ending and he would not bet any money on them. In 2017, Chicago exchanges CME and CBOE launched futures trading in Bitcoin. South Korean Finance Minister Kim Dong-yeon stated that banning digital currency exchanges was "a live option." Big companies like Microsoft and Dell are embracing Bitcoin as a payment option for their digital services. A Japanese company is also planning to pay part of its employee salaries in Bitcoin. Bitcoin may appear like a very profitable investment option to many, but the cryptocurrency market is very volatile and the risks associated with it are also very high. Following table explains the biggest falls in Bitcoin over the years. From the above table, we interpret that Bitcoin has given a decent fall at regular intervals. From 2011 to 2013, Bitcoin lost almost 91% of its value and this was a bear market for it. During this period, its value fell from $24 to $2.1. The next big fall for Bitcoin was from 2013 to 2017 when it plummeted by over 80% with its value declining from $1,137 to $208.3. There was another major correction in Bitcoin prices recently when prices corrected from $ 19,891 to $9,231.10, losing over 53%. However, the prices did not close at the low level and inched higher to give a weekly close of $11,494. Bitcoin has volatility seven times greater than gold, eight times greater than the S&P 500, and 18 times greater than the US dollar, according to Mark T. Williams. The average of the declines Bitcoin has witnessed between February 2011 and December 2017 is 37%. Further, the recent decline also hovered close to 37%. If you see the longer term chart structure, it has taken support at 61.8% retracement level of its previous up move from $5,393 to $19,858 levels. It has also recovered from a low of $9,231, forming longed legged Doji candlestick pattern. This week's sell-off tumbled Bitcoin below $10,000 for the first time since December. The charts indicate an upward movement or a possible reversal from current levels. On the other hand, the downward trend will continue. So, where will Bitcoin head from here, one will have to wait and watch! Bitcoin makes moving money across the internet incredibly easy, but that ease comes with risks. You should stay away from these currencies if you don't understand the risks involved. 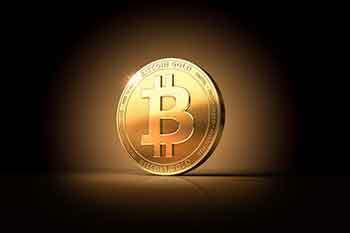 The government or Reserve Bank of India has not authorised any virtual currency (VC) as a medium of exchange. Further, the Government or any other regulator in India has not given licence to any agency for working as an exchange or any other kind of intermediary for any VC. Persons dealing in them must consider these facts and beware of the risks involved in dealing in VCs. RBI has also clarified that it has not given any licence/ authorisation to any entity/ company to operate such schemes or deal with Bitcoin or any virtual currency. The government also makes it clear that VCs are not legal tender and such VCs do not have any regulatory permission or protection in India. The investors and other participants, therefore, deal with these VCs entirely at their risk and should best avoid participating in them.